This maneuvre is used against an attacker closing fast from astern. It starts with a break, then a roll in the direction to the break. The fact that it is a high g maneuvre means that quite a lot of speed is lost, up to 100 knots in some cases, particulary if performed "over the top." If the attacker is closing fast and is caught by surprise he may easily fly through and end up in front, the postions reversed. If he attempts to follow the barrel roll, he will probally end up high and wide of the defender who can then turn in towards him, forcing him down and in front. But woe betide the defender who attempts a barrel roll in front of a slowly closing attacker who will follow him through the manoeuvre, ending on his tail easy gun range. His only recourse in this event is to jink. 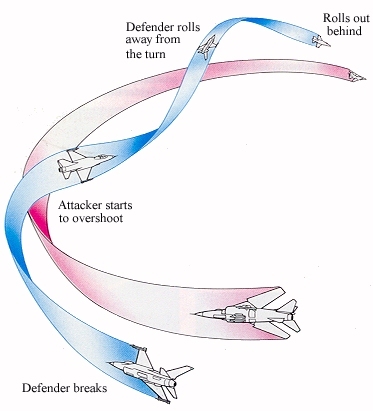 The High G Barrel Roll is a difficult maneuvre to execute successfully, and is in fact easy for the attacker to counter. It will only work if the attacker has been led into, or is in, a high angle-off, high overtake situation.